Maybe we all just settle down about Australia's next generation of tennis players? How good is Ash Barty?! Meh. The 22-year-old tried her guts out and made it further in her home grand slam than any Aussie woman in almost ten years. And yes, yes, she beat Maria Sharapova along the way, but the Russian has come back from her drug ban a shadow of her former self. That’s not to say beating the ex-world number one is to be dismissed out of hand, but Barty has a higher ranking than Sharapova – she was supposed to win that match. The reality check came in the form of a straight-sets smackdown courtesy of Petra Kvitová. Well, um, yeah, what about him? So the Demon was sent packing in the third round. That was also the case with De Minaur’s fellow teenage-hopeful Alexei Popyrin, and our other wildcard entry, Alex Bolt. 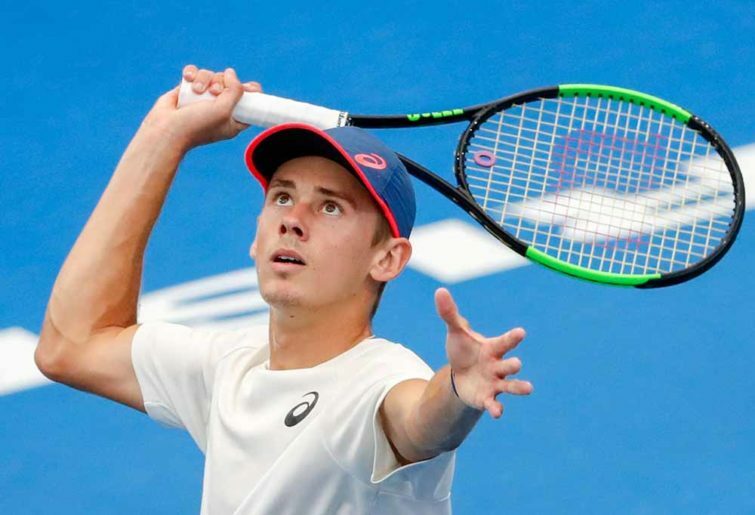 Popyrin and Bolt received a bit of hype on the back of their wildcard status – and, to be fair, the third round is a respectable showing – but the excitement was fuelled more by the fact that they played after De Minaur had already been knocked out, and thus were our last hopes in the men’s draw. So while we cheered throughout the first week of the Australian Open, we were left without a local hope pretty early on in the second. Now, I don’t want to be the tennis Grinch here, and I understand that when the global game’s attention is directed towards our shores, it’s important we put our players in the spotlight. But I wonder how excited we’d be about any of these players – mostly youngsters who have potential, but are a long way from turning it into grand slam trophies – were it not for the calibre of personality we’ve had served up in recent years. Bernard Tomic and Nick Kyrgios were our great hopes for big things, but it’s become abundantly clear that neither of them will live up to their potential. While both are still relatively young, the attitude they’ve shown over the years ensures they’ll never fulfil their immense promise. As for the Aussie women, when it comes to the trophies that matter, Sam Stosur’s 2011 US Open victory is actually the country’s most recent grand slam title. The last one an Aussie claimed before that was Lleyton Hewitt’s 2002 win at Wimbledon, which was preceded less than 12 months earlier with his victory at the US Open. And that’s been it for the 21st Century – three titles of a possible 77 (and that’s including the year 2000, which will be controversial among calendar experts). So it’s probably not unfair that for so long, Stosur and Lleyton – especially Lleyton – were held up as our best chance of turning that into four titles. But as retirement and the sheer weight of disappointing performances made it clear neither were going to win another one of tennis’ four major tournaments, we shifted expectations to the next generation – mainly Tomic and Kyrgios. And how did that pan out? Yeah, so well that at the age of 26 and 23 respectively, we’re already looking at the next next generation. So when teenagers De Minaur and Popyrin, as well as the 22-year-old Barty showed a bit of fight, got some decent results, and didn’t act like complete tools, we went a little bit nuts. And with time on their side, as well as what seems to be the ethic and attitude required to make the most of their obvious talent, one of these players could very well claim Australia’s fourth grand slam title since the year 2000 (1998 really, since that was Pat Rafter’s last win at Flushing Meadows). But not get too far ahead of ourselves in the meantime. Because y’know which other men made the third round of the Aussie Open? Scott Draper, Wayne Arthurs and Sam Groth. And which women made the quarters? Alicia Molik and Jelena Dokic. All of them were solid professionals who made a decent career on the court, but they’re blasts from the past rather than legends of Aussie tennis. And at this stage, that’s all our next wave of talent have managed. So while we’re right to get behind them, let’s also keep a lid on things until they show us whether they’re champions like Stosur and Hewitt, or decent triers like Groth and Molik. Or – heaven forbid, but there’s still time – wankers like Tomic and Kyrgios.